Get your friends involved by e-mailing them this page. Just use the bookmark below. Share these formatted resumes for free. They may even want to work with you in this occupation!! Use these 3 resume for cleaning formats and easily edit all three with your very own information after you download them. All you need to do is backspace the cleaning template information, and then just substitute your info. Afterwards, you just compare all three and then choose which one is to your liking. It's easy. These templates are a great and fast way to create your own resume. 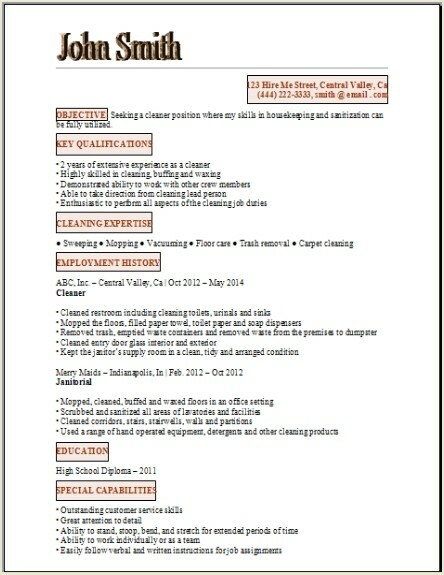 Make these professional free resume for cleaning examples more useful by experimenting with the design on your own. You can edit them for the use of commercial cleaning or house cleaning easily yourself. Make them show your expertise and get the call for the job. 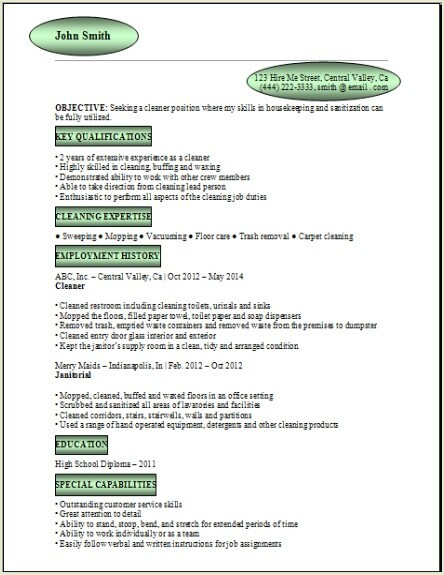 Put on your Resume For Cleaning Services Duties! 1) Cleaning rooms, the hallways, any lobbies, also lounges, and restrooms, any elevators, and stairways, also locker rooms or any other work type areas ensuring that cleanliness is being met. 2) Clean the rugs, also clean carpets, clean all upholstered furniture, the draperies, you will be using vacuum type cleaners and carpet shampooers occasionally. 3) Empty all wastebaskets, also transporting the trash to the dumpster area. 4) Carry your cleaning supplies, preferably on a wheeled cart. 5) Sweeping, scrubbing, waxing, polishing the floors, also using brooms, different types of mops, using powered scrubbing machines. 6) Dusting and polishing furniture and appliances. 7) Washing the windows, walls, ceilings, and woodwork. 8) Wash any dishes and cleaning the kitchen, including cooking utensils, also any silverware. 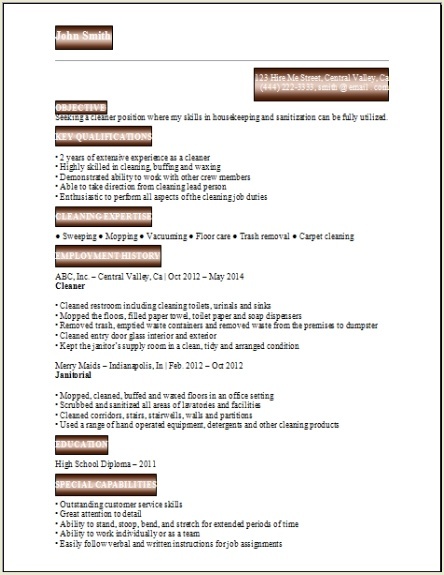 Personality you should have for Resume For Cleaning Services! Simple - Your job is making customers happy and cleaning their homes the way they want them cleaned, this will keep them very happy. Professional - Be determined at being the absolute best. Your main objective is taking care of the client, and doing it with a professional manner. Anticipate - Finds area's in the customers' homes that may be of concern in the future, and let the customer know you have taken care of it ahead of time for them!! Responsible - You must take personal responsibility for your work. Cleaning for the customer as if it were your own place. Kind - Always treat everyone with dignity and respect. Likeable - Keep a great attitude. The customer will enjoy being around you and more likely, call you back again. Expert - Take your job seriously. If you can find a better way, do it: I think I can get this a little cleaner? Is there a much easier way I can do this? Your clients will love you even more for the know how you have. How to interact with your client is very important in building a relationship with them. Sometimes it is even more important than the cleaning, since your attitude will provide the reassurance the customer needs that you are an expert and that you care about your work. Take pride in your work and you will go a long way. The job outlook for this service is climbing every year, and there are approximately 200,000 jobs that will be opening between now and 2016 according to the bureau of labor statistics. You can also make a good living for yourself on your own or work for a cleaning service that has an established client base in place.